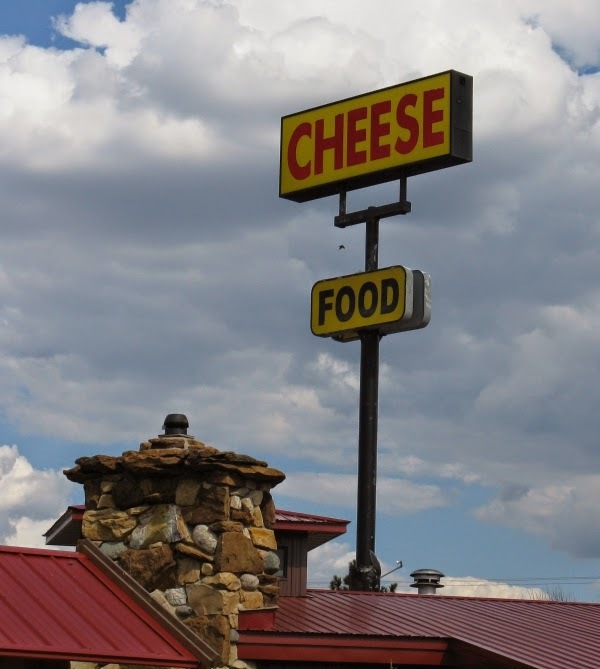 Up until a couple of centuries ago, a sign like this (which happens to proclaim the availability of cheese, and more generic food, in rural Wisconsin), would have been not only unlikely but also mostly pointless. For there would be no sense in putting up the word ‘CHEESE’ by the side of the road, visible to all, if very few people could read it. One of the most deeply influential social transformations of the 19th century, especially in the West, was the creation of literate societies – that is, societies in which a majority of people could be expected to read and write, and therefore in which public textuality could be functional and ubiquitous. If you are reading this, chances are almost certain that you live in a world of text, and that you perform countless acts of reading every day, not just because you want to but because you are required to do so to function in a literate society. Every time you buy a package of food, or travel down a road, or surf the Web, you are expected to read. The technology of writing has become so powerful and foundational that we find it very difficult to imagine a world without writing, or a world in which writing plays a very small and specialised role. When Geoffrey Chaucer imagined The Canterbury Tales at the end of the 14th century, his rowdy group of pilgrims, setting out for Canterbury, would not have assembled at a Southwark inn that had the word ‘Tabard’ written on it: there would have been, perhaps, a picture of a tabard (a medieval surcoat, worn over armour) or maybe even an actual tabard stuck up outside the building, and presumably also some kind of nonverbal icon, such as the traditional bush, to indicate that the establishment was an inn. Today we rely on text for that kind of identification. I suspect that if a medieval time traveller walked into a 21st-century industrialised society, one of the most overwhelming differences that would strike this undoubtedly bewildered person would be the extent to which we surround ourselves with writing, and the extent to which we rely on reading to conduct our daily lives. In medieval England, writing was a specialised technical (and usually an occupational) skill – like knowing how to shoe a horse or sail a boat. In 21st-century Canada, where I live, almost all adults are expected to know how to read and write, regardless of their occupation or social status, and anyone who does not have basic functional literacy skills is at a serious social disadvantage. It is a world created for readers. Digital technologies have not really changed that, and in fact have put even more text into circulation than before. Just as we don’t usually think about the air we breathe unless something bad happens to it, we don’t often think about the world of public textuality that we inhabit, even though it constantly influences our behaviour, our decisions, our thoughts, our imaginations. Even those who study the social dimensions of literacy tend to focus on objects such as printed books – their production, accessibility, and circulation – rather than on objects such as street signs. But for this reason it can be helpful to think seriously about the roles of literacy in societies where the skills of reading and the technology of writing could not be so easily taken for granted. For example, Richard Firth Green has argued that, in Chaucer’s England of the late 14th century, radical social upheaval surrounded significant shifts in the political and legal uses of literacy: shifts that called into question the meanings of authority and truth. Like any information technology, writing doesn’t just float around out there; it is controlled and used by individuals and organisations in subtle but powerful ways. This fact is no less true today, when our digital information technologies still rely heavily on the literacy skills that Western societies started to make ubiquitous, and thus to take for granted, in the 19th century. Dictionary of Words in the Wild. Green, Richard Firth. A Crisis of Truth: Literature and Law in Ricardian England. Philadelphia: U of Pennsylvania P, 1999. UNESCO, ‘The Making of Literate Societies,’ in Literacy for Life: Education for All Global Monitoring Report (2006) 189-213. The Medieval Codes Project is licensed under a Creative Commons Attribution-NonCommercial-NoDerivs 3.0 Unported License. Material on this website should be attributed to Yin Liu, Medieval Codes, unless otherwise specified. Alternate copyright restrictions may apply to some material on this website. We gratefully acknowledge the support of the following institutions and agencies, although responsibility for the content of this website remains with the project team.